So my last posting was about almond crusted white fish... and I loved it so much I tried it with salmon and it was even better! 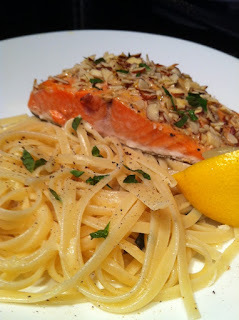 I even forgot garlic, which is UNHEARD OF in my kitchen, and it was still great! Preheat your oven to 375 degrees. And start boiling a pot of salted water for the pasta. Line a sheet pan with foil and drizzle a bit of extra virgin olive oil on it. 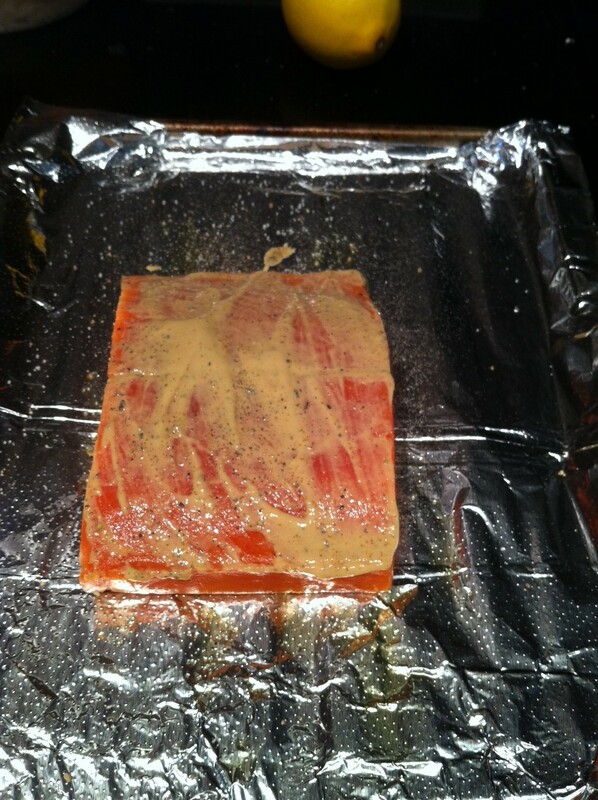 Sprinkle salt and pepper on the skin side of the salmon and place it skin side down on the foil. Sprinkle salt and pepper on the other side of the fish and spread the Dijon mustard on it. Add a small amount of lemon zest and top with the sliced almonds. Drizzle just a little more oil on top of the almonds. Bake the fish for 12-15 minutes until the thickest part is flaky. Once you put the fish in the oven the water should be boiling. Add your pasta. It usually takes 8-10 minutes. Drain the pasta and toss it with the butter and parmigiana cheese. By now the fish should be ready. Place your pasta and fish on a plate and squeeze half the lemon wedge on the pasta and the other half on the fish. Top both the pasta and fish with the chopped fresh basil.